I was going to call this post, "Oasis in the Desert", because that's how I was feeling last night. However, "Thirsty for Live Jazz" was on the flyer opposite, and it does sum up my own personal feeling - I love jazz, and I love good live jazz even more. I've mentioned Paul Ricard before here. Whether in solo session as last night, or as part of his Midland Jazz Connexion, the evenings are a delight for true jazz enthusiasts. Paul plays some of his own compositions, or beautiful renditions of jazz standards. It's unfair to pick out any pieces for mention, but I'll do it anywhere. I'm always delighted to hear Gershwin's "Summertime"; "Can't Buy Me Love" by the Beatles, and one of Charles Asnavour greatest songs, sung of course in French (I couldn't remember the name of it). These evenings in The Test Match (still officially known as a hotel, though it has never had overnight guests since it opened in 1938 - the word 'hotel' was included in the original application to make it seem more palatable than pub to the anti-alcohol brigade who were fighting against introducing liquor licenses in West Bridgford), are to me like coming across an oasis in the middle of a hot and arid desert. A bit fanciful I know, but judging by the relatively poor attendances at jazz evenings, I see the area as a desert, missing out on the delights of jazz. Are people missing out because they don't know it's there? If so, then the pub needs to advertise better. Or have people just decided that jazz isn't for them? If so, they need to get out more and listen to quality music of this genre. 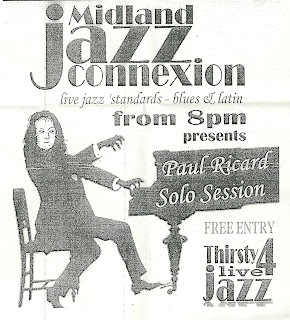 Paul and the Midland Jazz Connexion deserve to have a larger audience for their music. Plenty of people come into the pub to drink; it's time more people came into the pub "thirsty for jazz". 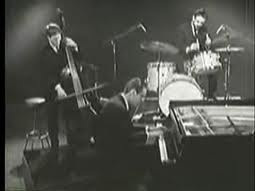 When I hear Paul play, I'm reminded of the incomparable Bill Evans and his trio. I don't mean to say that there's imitation, it's just that I sense an influence. Paul will no doubt explain the technical differences, but I'm not a musical intellectual; I'm just a simple soul who appreciates what he hears in good music. I think it was Louis Armstrong who said, "If you have to ask what jazz is, you'll never know". "Evans was always completely concentrated into his music. Somber, and in fact often almost funereal in aspect, the world existed in his hands, and he ceded everything to them. One could see the transfer physically. Only someone willing to play in that way could embody the million and one subtleties Evans displayed as a matter of natural course, from impeccable volume control and dynamics, to brilliant clusters of improvisation that seemed too knowing, pre-scripted, part and parcel of the writing, impossible to be the spontaneity they were. And his transitions in speed and tone! Panthers and gazelles cannot move more gracefully". If that's not enough to get you out and buying Bill Evans' music, then perhaps the following clip will clinch the matter. It's his own composition called 'Waltz for Debby', which was written for his niece, and shows us everything about Bill Evans. Happy listening, and if you're not already there, join me at the oasis, and be thirsty for live jazz.